Shibani Dandekar and Farhan Akhtar, who are currently holidaying in Mexico (going by Farhan’s recent Instagram post), shared more envy-inducing pictures from their dreamy vacation on their respective Instagram profiles (but more about that later). 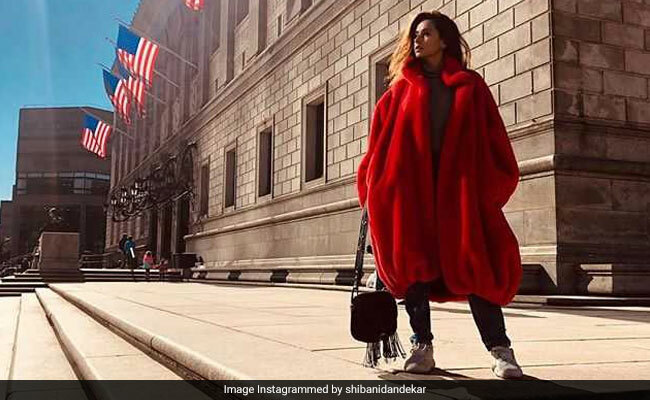 On Wednesday, Shibani Dandekar shared a stunning picture of herself dressed in an oversized red Balenciaga coat on Instagram and the photo credit went to (no points for guessing) her boyfriend Farhan Akhtar. Shibani captioned the picture: “That Boston Balenciaga swagger” and referred to Farhan Akhtar as an “ace fashion photographer” in her caption. On the work front, Farhan Akhtar will next be seen in Shonali Bose’s The Sky Is Pink, co-starring Priyanka Chopra and Zaira Wasim.